As per Figure 3.8, an incorrect technique is being demonstrated because the pads of the three fingers are being placed on the ulnar side of the wrist. 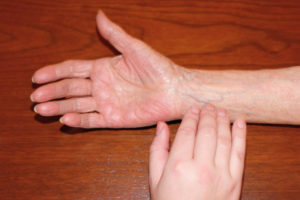 The correct technique (Figure 3.9) to palpate the radial pulse involves placing the pads of the three fingers along the radius which is on the lateral side of the wrist (the thumb side). The pads of the fingers are placed on the radius bone close to the flexor aspect of the wrist. While palpating the pulse, gently place the pads of your three fingers along the radial bone at the flexor aspect of the wrist (the thumb side). Finding the Error Activity: Radial Pulse – Feedback by Ryerson University is licensed under a Creative Commons Attribution 4.0 International License, except where otherwise noted.